When you hear a celebrity say, “Wow, this faux fur coat is nice!” your eyes are automatically drawn to that item. And so you realize you’ve added a “nice” faux fur coat to your winter wishlist. 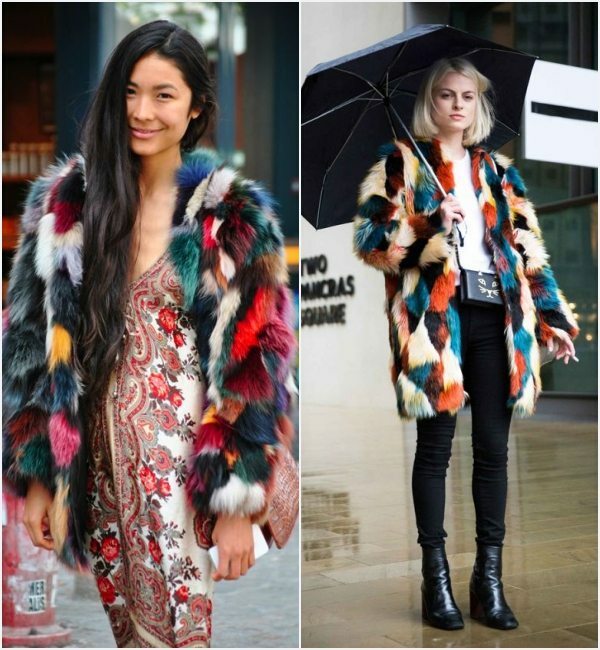 The colorful faux fur is the must-have coat this winter. If you pay attention to your Instagram feed, Pinterest or any other fashion platform you’ll be able to see it in all its splendor. Buying a faux fur vest is a good choice, but the coat is more comfortable to wear, plus it’ll keep you warmer. The prices are roughly the same as those of the faux fur vests. Most international designers have renounced natural fur clothing from their collections. And rightly so! Nowadays the faux fur coat looks good, and it mimics perfectly the natural fur. It costs a lot less; it’s cruelty-free, so you have no reason to avoid it. I searched for colorful faux fur coats online and found many affordable models. Click on the pictures below to find out how much the faux fur coats I’ve selected cost and where can you purchase them. 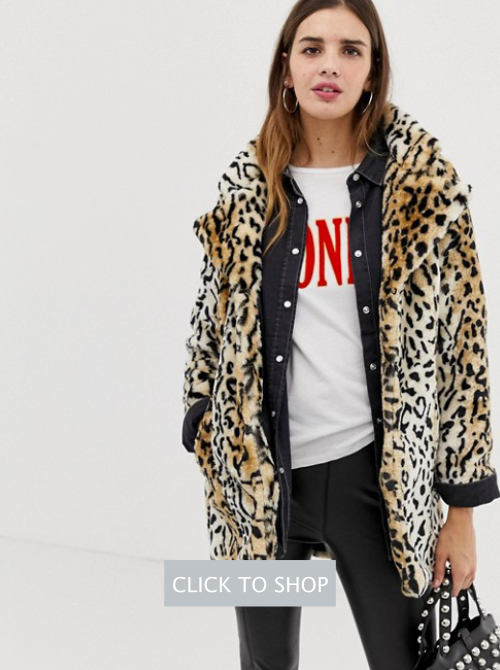 Faux fur Asos coat, animal-print, fully lined, ideal for an eccentric look. Pair it with black skinny jeans or leather pants, rock boots, a plain tee and you will get a chill, relaxed outfit that will turn heads! 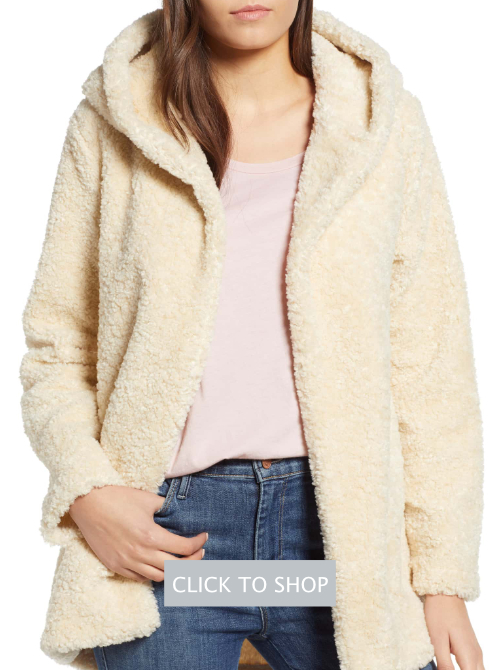 A cozy coat made from dense warm faux fur, topped with a slouchy hood. Available on ivory and cognac. One of the best prices from all these selected items, machine washable and tumble dry, always a plus! 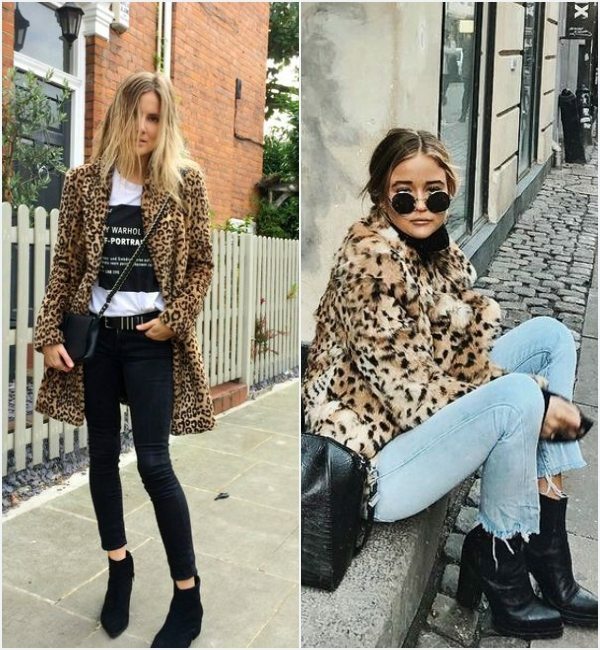 The animal print has been, is, and will always be on trend. But it must be the star of the outfit. That’s why I recommend you to wear it in dark-colored or monochrome outfits. The material is so pleasing to the touch that it automatically gives you a relaxing feeling. You will love it! The fluffy pink-ish fur coat is the piece of resistance in your winter-winter wardrobe. It’s versatile and gives you a sophisticated, lady-like look. Fuzzy-wuzzy even when the weather is harsh in this fluffy puffer jacket from Light Before Dark that’s the perfect late ‘90s look. Wear this eco-friendly coat with a rock-inspired black top, a pair of ruffled jeans, and ankle-high boots. This year you should be wearing a lot of color block items. With this lilac faux fur coat, you can fully enjoy this trend. Bring up her awesomeness by wearing it with a pair of jeans, a fluffy sweater, and furry boots. That’s a lovely faux fur teddy coat, yellow mustard, regular fit, fully lined with two side pockets. You can wear it with a cute sweater dress and over the knee boots or with moon boots, a cute hoodie and a simple pair of jeans. If you love the sporty style, I recommend the emerald green fur coat from Style&Co. You can wear this lovely faux fur jacket with boyfriend jeans, a baggy sweater, and army boots. A black synthetic fur coat can get you out of anonymity. You can wear it casually with jeans and army boots, as well as with more elegant items like a midi dress and ankle boots. We’ve seen where we can buy cheap colored faux fur coats online. Now let’s see how to wear them according to the trends of the season, but also with a touch of sparkly personality. I’ve “stalked” Pinterest feeds and, of course, I’ve found a lot of outfit ideas with the colored faux fur coats. That’s a sign that fashion designers have already adopted this multicolored trend. Let’s see how they suggest wearing the faux fur coat in trendy outfits, and the color palette used to highlight it. Pink is an intense color that will no doubt be the focus of attention. And you should please it. 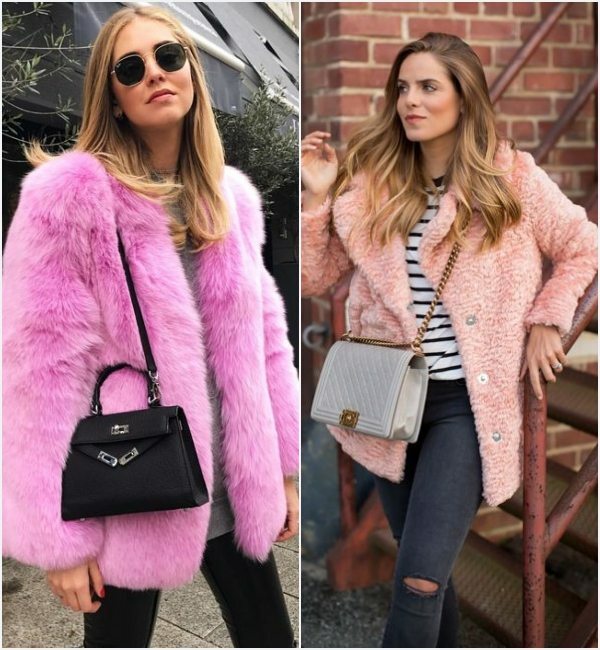 Wear the pink faux fur coat with neutral colors: a pair of jeans, ankle boots, and a simple top are enough to highlight the pink colored jacket. Yellow is a color you should wear with high levels of confidence the wave this season. You either love it or hate it! Just like the pink, yellow is an intense color that you need to highlight by wearing a neutral palette of color. You can’t go wrong with a classic pair of jeans, a white top, and a few flashy accessories. In the case of the colorful faux fur coat, the same rules apply as with the accent colors. Merely stick to neutrals for the underneath outfit. Or you could turn On your full excentric mode and wear the multicolored faux fur coat with a chic, feminine floral dress and stilettos. Animal print is by far my favorite when it comes to wearing something colorful. It fits nicely with all-black or brown toned outfits; it highlights the complexion without making a huge contrast, such as yellow or fuchsia. Wear the burgundy faux fur coat with skinny jeans or leather pants along with a top/sweater and a small metal purse. It is a known fact that blondes look their best in dark colors, so their go-to faux fur coat should be an emerald green one. As for brunettes, their choice is evident this season: mint green looks fantastic. The price of a beautiful looking faux fur coat is not neglectable; it goes up from $50 to more expensive models from well-known brands. No matter the price, you should know how to care for your faux fur coat, to keep it in good condition for the next seasons. Carefully read the cleaning instructions. If allowed, use the delicates washing machine setting. Do not dry it in the dryer. Instead, air-dry your faux fur coat. Put it on the hanger in a well-ventilated space, away from the sun though. I’ve read that you can put the artificial fur in the freezer to prevent the fall of the threads, but I haven’t tried this method. Honestly, it sounds more like a myth than a practical solution. Perhaps the safest option to wash and dry your faux fur coat is to take it to the dry cleaner. Those were my thoughts and recommendations of the day on the affordable women’s faux fur coats. Keep it classy and…don’t forget to subscribe to our free newsletter for more online deals and fashion trends. Happy shopping! Add your email address to get notifications when we publish new articles on MUJO Magazine.